A late preterm female infant (36 weeks) was admitted to the minimal care neonatal unit being diagnosed with frequent supraventricular extrasystoles. Echocardiography performed by a senior pediatric cardiologist did not reveal morphological alterations nor cardiac dysfunction. Given the persistence of the condition at 2 months of age, she underwent a Holter monitor, recording supraventricular extrasystoles in up to 25% of beats. At 3 months of age, beta-blocker treatment with propranolol was initiated as the patient presented poor clinical tolerance to the tachyarrhythmia. A partial response was observed, the patient remaining arrhythmic but with better clinical tolerance to the arrhythmia and without heart failure signs. The electrocardiogram revealed persistence of frequent supraventricular extrasystoles [Figure 1]. 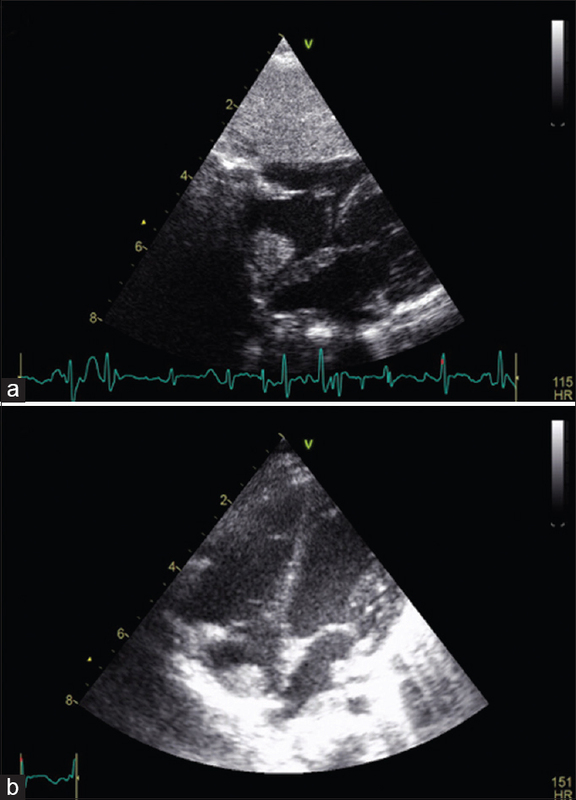 In a subsequent echocardiography study, a hyperechoic image of thickening in the right atrial roof was observed, which could not be seen previously [Figure 2]. Magnetic resonance imaging identified a homogeneous mass of 2.2 cm × 1.5 cm × 0.8 cm in the right atrium, near the crista terminalis. The mass was discretely hyperintense to the myocardium on the T1-weighed turbo spin-echo sequence and isointense on the T2-weighed short tau inversion recovery (STIR) sequence. It showed a discrete homogeneous enhancement after contrast administration, similar to the intensity increase of the myocardium. The mass was well delimited with respect to the circulating blood in the steady-state free precession (SSFP) sequences [Figure 3]. The anatomopathological study of the surgical specimen described a well-circumscribed nodule with homogeneous firm-elastic consistency. In the histological examination, “spider cells” were observed: clear cells with wide vacuolated cytoplasm and eosinophilic nucleus, occasionally with formation of hyaline globules of muscular appearance and immature and benign characteristics. The periodic acid–Schiff stain applied to these cells was positive, demonstrating the presence of abundant glycogen. The “spider cells” are characteristic of cardiac rhabdomyomas and represent degenerating rhabdomyocytes. After a 6-year follow-up, the electrocardiographic studies and the Holter monitoring have not shown any alteration of the heart rhythm. After the diagnosis of rhabdomyoma, screening for tuberous sclerosis was performed, without any stigma of this disease being found so far. A study from Children's Hospital in Boston analyzed the patients being diagnosed with a primary cardiac tumor for 21 years, concluding that 24% had had at least one clinically significant rhythm disorder. Specifically, arrhythmia was described as the initial symptom in 13% of rhabdomyomas. Rhabdomyomas are benign tumors originated from cardiomyocytes. They mainly appear in the ventricles but can also be found in the atria and cavoatrial junction and on the epicardial surface, usually being multiple. They have a wide clinical spectrum, the majority of patients being asymptomatic. Large tumors can cause an obstruction in the outflow or inflow tracts, and small ones can affect the conduction system causing dysrhythmias., In this case, we are reporting a single rhabdomyoma located in an atypical location, near the crista terminalis, and diagnosed due to frequent supraventricular extrasystoles, the appearance of which preceded the capability of echocardiography to identify the tumor. Magnetic resonance imaging allows a better evaluation of some tumors in which echocardiography is suboptimal, especially in terms of tissue characterization, and provides a closer approach to histological diagnosis. In this case, the main diagnostic probabilities were as follows: a thrombus, which normally does not increase in intensity with contrast but may increase if it is organized, or a myxoma, not very prevalent in pediatrics and usually appearing in the left atrium near the interatrial septum. 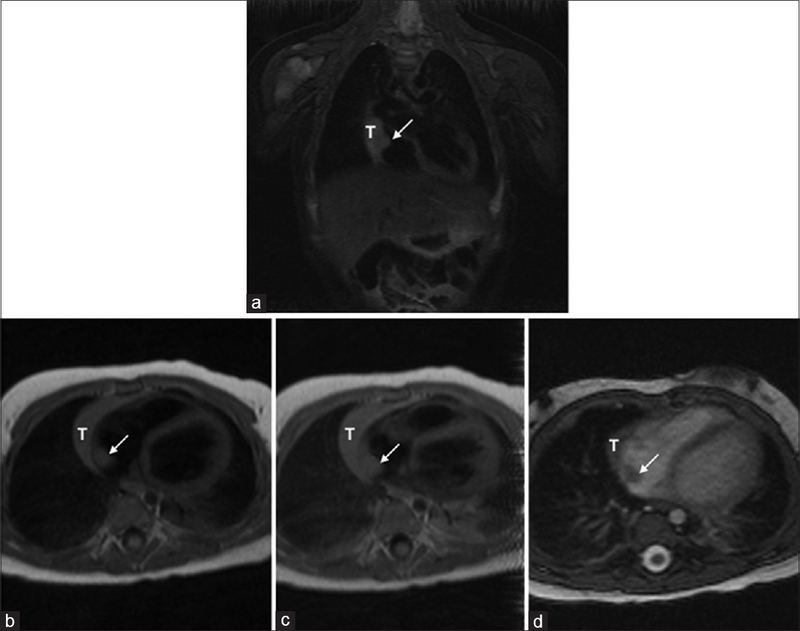 The diagnosis of rhabdomyoma was unlikely since, normally, they are isointense in T1 and slightly hyperintense in T2 and do not present enhancement with intravenous contrast administration, and they are mainly located in ventricles. The final diagnosis however is always anatomopathological. Another feature of rhabdomyomas is the possible spontaneous regression, occurring in more than 50% of cases., A lower capacity for regression in tumors located in the right atrium is reported, and this is the area where the tumor that we are presenting is located. Due to its benign nature and its ability to regress, surgery is recommended only for those patients with hemodynamic compromise or for those with refractory dysrhythmias., In our case, surgery finally resolved the extrasystoles, with the patient being currently asymptomatic after a 6-year period. Freedom RM, Lee KJ, MacDonald C, Taylor G. Selected aspects of cardiac tumors in infancy and childhood. Pediatr Cardiol 2000;21:299-316. Miyake CY, Del Nido PJ, Alexander ME, Cecchin F, Berul CI, Triedman JK, et al. Cardiac tumors and associated arrhythmias in pediatric patients, with observations on surgical therapy for ventricular tachycardia. J Am Coll Cardiol 2011;58:1903-9. Sánchez Andrés A, Insa Albert B, Carrasco Moreno JI, Cano Sánchez A, Moya Bonora A, Sáez Palacios JM. Primary cardiac tumours in infancy. An Pediatr (Barc) 2008;69:15-22. Shi L, Wu L, Fang H, Han B, Yang J, Ma X, et al. Identification and clinical course of 166 pediatric cardiac tumors. Eur J Pediatr 2017;176:253-60. Ying L, Lin R, Gao Z, Qi J, Zhang Z, Gu W. Primary cardiac tumors in children: A center's experience. J Cardiothorac Surg 2016;11:52. Díaz Angulo C, Méndez Díaz C, Rodríguez García E, Soler Fernández R, Rois Siso A, Marini Díaz M. Imaging findings in cardiac masses (Part I): Study protocol and benign tumors. Radiologia 2015;57:480-8. Farooki ZQ, Ross RD, Paridon SM, Humes RA, Karpawich PP, Pinsky WW. Spontaneous regression of cardiac rhabdomyoma. Am J Cardiol 1991;67:897-9.